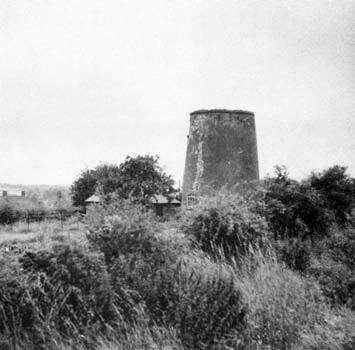 Sedgeford towermill was a small 3 storey mill standing alongside various outhouses that included a bakery. The tower was built of flint rubble and then cement rendered on the outside and plastered on the inside.. The only brick was around the door, the windows and the curb. The ogee cap was quite ornate and held a gallery and fan. The above photograph clearly shows where the sails have scraped against the side of the tower. At ground level the inside diameter of the tower was 14ft 6ins with the wall being 2ft 9 ins thick. The brickwork at the top of the tower was originally around 3ft thick. The single door was double leaf and there was one window to each floor. At the Globe Hotel, Lynn, on Wednesday 18 January 1871 at 6 for 7 o'c in the evening in One Lot. The whole producing an annual rental of £31. Wanted, a Man to Work a Windmill. One who has some knowledge of Baking preferred. Good character indespensible. Apply T. Leggett, Sedgeford, Kings Lynn. WANTED, a hand in the above line; on with some knowledge of milling preferred. Interment at Docking of William Lake, died 10 February. Born 1828. Apprenticed to a miller at Sedgeford. 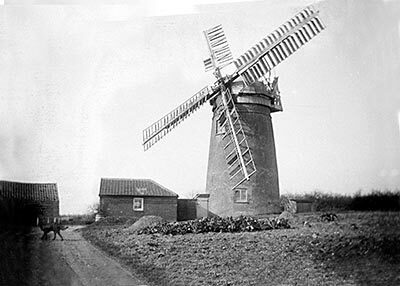 Soon afterwards entered service of Robert Brooks of Thornham, miller, baker and seed merchant. In 1979, Frederick Huggins showed some photographs to Harry Apling. One photo showed three men from the village: On the left was George Henry Jacobs, listed as newsagent & subpostmaster in Kelly's Directories from 1900 - 1937. In the centre was Mr. Drury of whom no information was known and on the right was Thomas Raines, who was also listed in Kelly's Directories. In 1908 he was shown as a coal dealer & boot repairer; 1912 as a coal dealer & farmer and in 1922 as a farmer. Frederick Huggins also still had one of the damsels fdrom the mill. 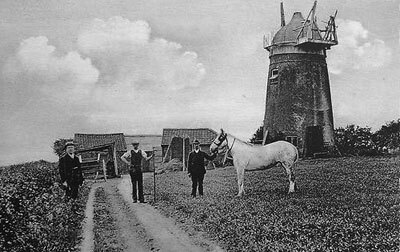 In 1982 Harry Apling reported that in a photocopied list of Norfolk windmills painted by Karl Wood and held in the Usher Gallery in Lincoln, it was mentioned that the mill had been Struck by lightning in 1910 and burnt out.